On Jan. 3, Yahoo! News published a speech by Chinese President Hu Jintao, delivered at an annual policy meeting of the party’s Central Committee, “Hu: Hostile Forces Seek to Westernize, Split China” (by Gillian Wong, Associated Press). Hu said his country is in a “cultural war” with the West and that China must battle the “international hostile forces” behind the barrage of foreign culture, which he considers part of a strategic plot of westernizing and dividing China. The announcement by Shanghai General Motors carried the header: "Joining hands with China Film Group, Cadillac whole-heartedly supports the making of the Birth of a Party." Of interest in this respect is the involvement of some American business companies in contributing to this Chinese communist propaganda effort. Cadillac, a division of American General Motors auto company, one of the auto companies which received federal (taxpayers’?) bailout money in 2009 to avoid bankruptcy, committed itself to funding the production of a Chinese Communist Party propaganda film “Birth of a Party,” or “The Great Achievement of the Founding of the Party.” The film commemorates the founding of the Chinese Communist Party, a political organization which has been responsible for the deaths of many millions of human beings whose only crime was that they may have disagreed with the Party. 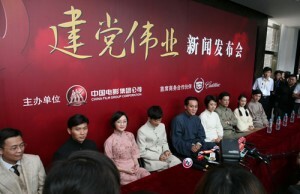 The participation of the American company, which agreed to pay for the production of the Chinese communist propaganda film with the American taxpayers’ money, is highly unprincipled, immoral, and disloyal and is nothing more than the appeasement of a power hostile to the United States in the name of financial gain. Well, the Marxist-Leninist-Stalinist-Maoist stuff is still considered sufficiently effective for the total subordination of the brain of every Chinese. China used to be one of the most reliable slave camps for centuries. On the other hand, many of today’s countries cultivate freedom, not the Chinese slavery. This is what the leaders of China take into account: an old Chinese slave was reliable, in contrast to a modern inhabitant of a free country. Freedom is the worst enemy of a slave society. Once upon a time every city was a slave city: all of its inhabitants were slaves except, of course, for their owners. But in those days, a slave country knew how to grow and maintain its slaves. Today the free countries emanate freedom via their international radio, television, the Internet, and via their artists and intellectuals traveling abroad. China’s rulers realize the force of the social media: China has more than 485 million Internet users, the most of any country in the world, which they consider a danger to their existence. Recently Chinese officials imposed tighter Internet restrictions on most microblog services as well as strict guidelines for social media sites: the users are required to register with their real names, a move likely to deter many online users. Authorities also have blocked Twitter and Facebook. Freedom is good for any country in the sense that it expands the human brains, which produce the best science and technology of genius, since genius requires freedom. Well, having deprived itself of freedom, a country perhaps gets rid of creative thoughts as well. The older generations of the Chinese were deprived of freedom for centuries. That is, in the absence of freedom, the regime deprived them of “dangerous thoughts.” As a result, they may have actually been deprived of unusual, original, valuable brain cells, necessary for creativity. Current or future Chinese “emperors” may find a “scientific” way to eliminate the creative brain cells from the brains of their slaves without raising any suspicion on the part of their victims, so that the unsuspected victims will have no recourse against the perpetrators. In this way, no “murder against the people” would have to be committed, and there would be no need to secretly liquidate those who might have otherwise turned out to be “enemies of the people,” just as those other “enemies of the people” who “tell dirty jokes about the only just social system possible” and who have to be mercilessly dealt with by the system. I am sure that if the slave countries preserve themselves, they will find a way to effectively eliminate with reliable secrecy all those “dangerous speakers and talkers” threatening their power.